Mike Carrivick, former chief executive of the Board of Airline Representatives in the UK (BAR UK) Ltd, reports on something different. Before BAR UK, airlines (BEA, Qantas and Brymon Airways) formed the bulk of Carrivick’s career, plus IATA. He has also been MD of Maersk Travel, and rose to become deputy chairman of the Guild of Business Travel Agents (now GTMC). Today, he works with Videcom, SDS-ES, and is also on call as a team member at Kenyon International Emergency Services, providing support services at its UK centre in Berkshire. Within the industry at large, he is a Fellow of the Royal Aeronautical Society, a committee member of the Aviation Club and a volunteer with Aerobility, the flying charity for the disabled. The aspiration to undertake the trip to this beautiful white sandy beach was sown during a short posting to Islay (Inner Hebrides) in 1966 while I was working for British European Airways (BEA). The realisation of it took another 52 years, but was well worth the wait! 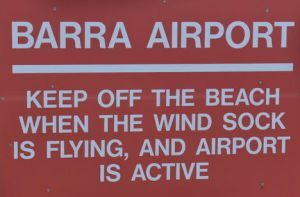 The beach in question is on the Isle of Barra (Outer Hebrides) and, subject to daily tidal flow, it also operates as Barra Airport, the only such airport in the world with scheduled-service flights. The schedule varies according to the tides! BEA operated the flights back in the 1960s. Today, Loganair has taken on the service, offering two flights a day with its Viking Twin Otter Series 400 aircraft, 19 seats, originally titled DHC-6 and affectionately called "Twotters". Small and dinky maybe, but well-suited to harsh salt-water conditions. However, as I have BEA’s airfield chart of Barra (dated 1964), I gave a copy to both operating crews – they were both intrigued and delighted! Using Loganair’s great day-return trip of just £75 from Glasgow during the December - March period, I flew out on the first flight, arriving at 11:30, and departed on the second one at 14:35. Each flight lasts about 1hr. While Glasgow was cool and cloudy, the further west we flew, the better the weather became, resulting in azure blue sea and pristine white beaches. 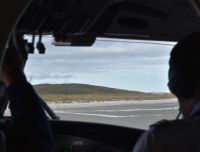 First sight of Barra was several miles out, after which the slim neck of land that marks the airport location came into view – with three ‘runways’ to choose from, which would be used? Runway 15 (southerly heading) was the answer. A firm but unalarming touchdown followed, with short landing distance and lots of spray (as is the norm from all the standing water). It just seemed so surreal and yet so natural at the same time! A quick burst on the engines turned us around, and we ‘motored’ up the beach to stop alongside the tiny terminal building. The sand is so firm that while tyre marks could be seen, there wasn’t any sign of wheel ruts – awesome. One can then either tick the bucket list box and wait 3hr in the friendly airport café or, much more productively, take in some of the island. There wasn’t time to take in the various ancient sites that exist, so I hired a cab (from a very friendly Robbie) for a drive around the main road that hugs the coastline in a circular route. The chance was taken to buy some local craft produce (sold by a lady who had moved to Barra from Plymouth 30-plus years ago! ), plus some hot smoked salmon from the island’s fishery, Barratlantic – looking forward to that! Talking to Robbie, it soon became very evident just how important are the sea and air transport, of which the Loganair flights provide onward connectivity to the UK, Europe and the world. Very soon, it was time to get back to the airport for the return flight. I sat almost immediately behind the pilots (there is no cockpit door on the Twin Otter), not quite the jump seat, with a fabulous view ahead, watching the immensely impressive short take-off run and rate of climb that followed − the Twin Otter is a great STOL (Short Take-Off and Landing) aircraft. The trip in fact recalled Brymon Airways (BC), which operated up to eight, most successfully on the Plymouth – Isles of Scilly run and to Gatwick. In fact, the once-De Havilland Canada aircraft must go down as perhaps the longest running production “airliner”, having first flown in May 1965 (the Boeing 737s maiden flight was April 1967). Today it is assembled by Viking Aircraft of Victoria, British Columbia, and iis fast approaching the 1,000th delivery. Loganair today operates a fleet of 30 aircraft including three Twin Otters, one of which is an original, plus two new-builds for the Scottish government's Public Service Obligation routes between Glasgow and Campbeltown, Tiree and Barra. What a day. The STOL qualities were again demonstrated during the landing at Glasgow, a reminder of BC dropping in at Gatwick all those years ago, in between the big jets. There was a single crew back then and the trick was to chat up the pilot before boarding and secure the right-hand seat. Within the next hour I was back on an easyJet flight to Gatwick (left 10min early and arrived LGW 20min early with no DH6s slowing us down!). A great day was almost over, but was enhanced by the M23, M25 and M3 all behaving themselves during rush hour. This was an aviation bucket-list trip for sure, but hugely enhanced by taking in the island and experiencing something of a different lifestyle. I recommend it. PS: We are assured by Loganair it will not be landing on Southend beach with the new service from Carlisle. And in truth the Twin Otter is a bit slow for the trip. (See Loganair partners Carlisle in this issue). I too fulfilled my 50 year ambition to fly to Barra with Loganair in 2014. Great trip and took 50mins from GLA. The return took 5.5hrs on the ferry to Oban and another 3.5hrs on the train to Glasgow. Proof positive of the benefits of air travel. Long may Loganair prosper.